You can read what they charged at a station off the freeway in Willows, CA, on Sunday. The Oregon traveler in California is in for a shock, or at least a mild surprise, when he stops for gas for the first time: The price of gas is about half a dollar more south of the state line than north of it. And that’s even though you do the pumping yourself. How come? The public explanations are not all that clear, and most of them we’ve heard before in connection with fuel price spikes up and down the west Coast: The change from summer to winter fuel, which can be produced only in certain refineries; the shutdown of refineries either for maintenance or because of accidents like fires; the small number of refineries; state taxes that differ from state to state; and so forth. In California, the explanations for gas prices higher than elsewhere also include a special carbon tax to fight climate change, the result of a state-run cap-and-trade system that has been applied to motor fuels since Jan. 1, 2015. Before that date, the California Air Resources Board estimated the law would raise the price of fuel by 12 cents a gallon to start and up to 76 cents later on. If that’s how it worked out, it would account for part or all of the price difference in the two states. This was a hot topic in Oregon last year when Oregon’s so-called clean-fuels program was set to expire before it was actually applied. Critics — including me — warned that the state’s program would raise the price of gas just like in California. But the Democratic majority in the legislature renewed the anti-carbon law anyway. Yep, as a frequent traveller to CA, I can confirm that their gas prices are pretty much always higher than in Oregon. There is no service — just a man behind a counter or a glass box to take your money. This is one of the reasons I do not support self-service in Oregon. I believe the added jobs help the local community and do not significantly impact the cost of the gas — any savings would simply trickle up to corporate somewhere. 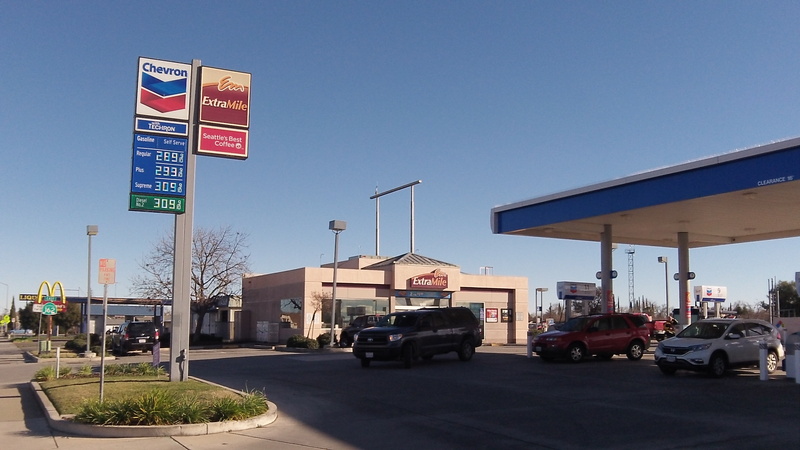 I was in New Mexico in December, and gas there was much cheaper than the West Coast though. I filled up the rental car for something like $1.75 / gallon. Gas seems cheaper in the middle of the U.S.